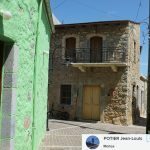 Mohos and Krassi are two small traditional villages that are nestled on the flowing plains of Lassithi Plateau, both villages are untouched by mass tourism and life continues at a steady pace and the traditional Cretan way of life is all around. 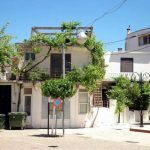 You can find the village of Krassi by following the road that leads into Malia Old Town, then straight up into the mountains, it takes about 20 minutes to drive into Krassi. To find Mohos just head straight up the mountain from the main national highway instead of following it through to Heraklion if you’re coming from Agios Nikolaos. They are easy to find and well signposted. Apart from the occasional souvenir shop life continues at a slow pace, with the men spending most of the day sitting in cafes playing backgammon and drinking coffee and the women at home looking after the children or making some exquisite blankets and linens you can find for sale around the villages. This pretty mountain village is situated on the way to the upland part of Lassithi Plateau. 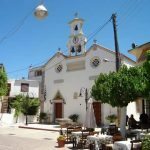 The village has preserved much of its original character, with picturesque alleyways leading off into the village, flower filled courtyards, lovely white washed churches and chapels. 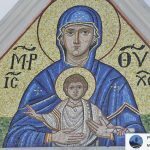 One of the main draws to Mohos is the beautiful church of Panayia with its impressive Byzantine icons, murals and wall paintings. 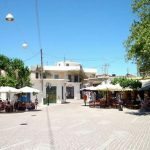 Travelling into the main village square of Mohos you can sit and have a light lunch or a frappe and enjoy the Cretan pace of life. 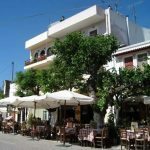 If you decide to venture up of an evening up in the evening the village is even more charming by moonlight and if you can get a table you will be able to taste some of the most mouthwatering homemade Cretan dishes at next to no cost. 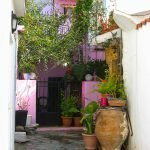 If you have a chance to visit Mohos on the weekends, you have a chance of seeing a traditional Cretan wedding, or maybe one of the organised Greek nights that the locals have during the summer months. Below is a few select pictures of Mohos taken by a very talented photographer, managing to capture the beauty of this mountain village. 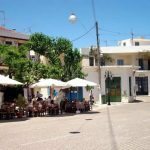 Just a short drive up into the mountains from the resort of Malia you will find the quiet and tranquil village of Krassi, the eastern most village in the prefecture of Heraklion. Krassi is located on the northern slopes of Mt. Selena at an altitude of 600m above sea level with a population of only 350. 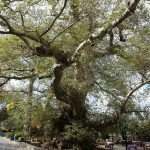 In its centre a giant plane tree sits proudly, and has earned itself the title of the oldest tree in Crete. 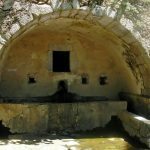 Next to the oldest tree in Crete you will find a well that has crystal clear water running directly from the spring of Mount Selena. 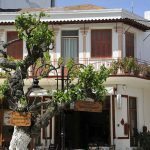 Next to this you will find a tiny little shop that sells assorted groceries and trinkets, but it also sells the national drink of Crete, which is Raki. 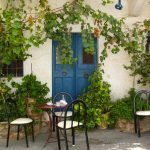 When you think of a Greeks favourite drink you think Ouzo straight away, but don’t be fooled – the Cretans prefer something with a bit more of a kick and you will find many a small glass filled with Raki after dinner or in the afternoon with cucumber slices. Another famous export from the village of Krassi is the local wine, known as “Krassi Wine”. The wine is an acquired taste and comes in red and white flavours, it can taste quite bitter but the more you drink of this wine, the less you taste it, and before you know it you will be very drunk off a few glasses. All about the Raki – Yammas! Raki is locally brewed and can be up to 70% alcohol, because its a locally produced and passed down to family and friends you will never know how strong it actually is. The local name for Raki in Crete is tsikoudia, and its not to be confused with Raki you find in Greece or Turkey. Its brewed in very old breweries found in locals back yards, and made from the left overs grape seeds and skins from wine production. The stronger the Raki, the sweeter it is, although most people not native to Greece or Turkey wont like it enough to sip it like the locals and its normally taken down in one via a shot glass. If you are going to drink a lot of Raki or drink it over a period of a night, drink a little water with it also. Do not switch to drinking other alcohol like beers or wine, or you will wake up with the worst hangover of your life. You can buy locally brewed Raki for just a few euros, or buy the manufactured factory Raki for a few more euros. Check with a local, or your rep before you fly if you can take bottles of Raki back in plastic bottles in your suitcase anymore.